DEAD SLOW is a techniques that demands to be mastered when fishing high pressure trout ponds. This technique becomes more and more effective as the situation get tougher, however not every lure has the action required for dead slow cranking. CRANKIN' PUPA MIDUKI has been designed to produce a wide roll action that is effective and can be used by any angler. Stretching the proven CRANKIN' PUPA body, gives the lure a wide wobble action. 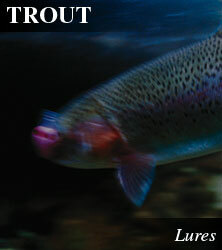 Built with a wide lip not normally found in trout lures of this size, it has a very stable action even at dead slow. A balanced slow sinking lure, simply "countdown" to your target depth range after splashdown. A must have lure for experts and beginners alike, seeking to master the dead slow retrieve technique.